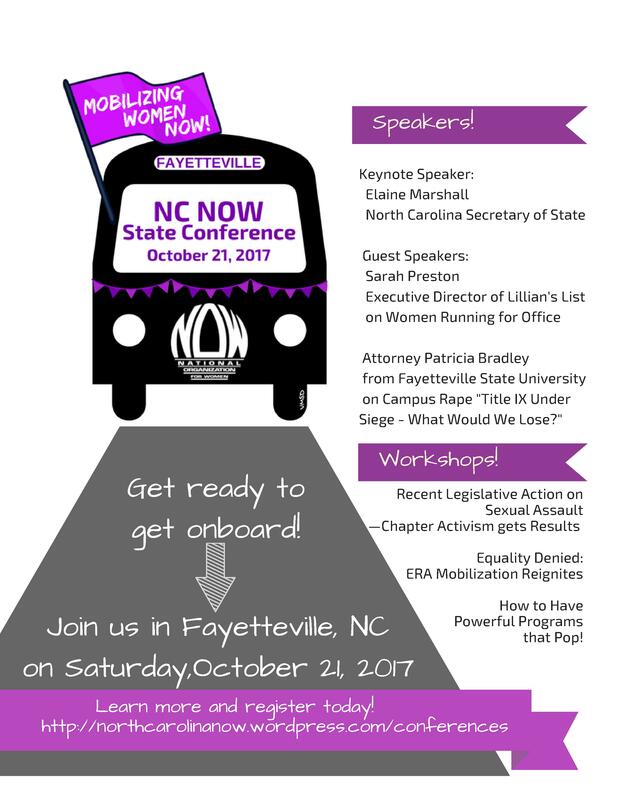 Join us in Fayetteville on Saturday, Oct 21, 2017, from 9am-4pm. Conference registration form here! Register online through eventbrite here. This year marks NOW’s 51st anniversary (founded in 1966), and the world has turned darker since the promise of last year. Women are ready to move forward, not back, despite an administration and an NCGA that seems determined to move all of us backwards, toward inequality. 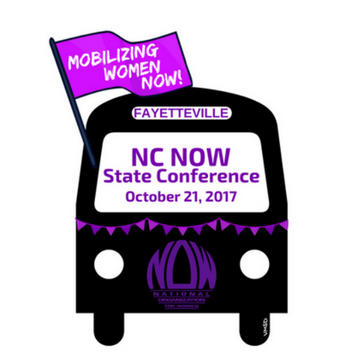 Our conference theme is “Mobilizing Women NOW!” Get ready to get onboard! 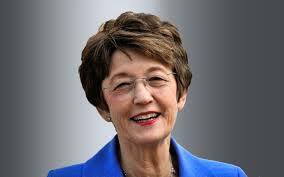 Our keynote speaker is Secretary of State Elaine Marshall. Marshall was first elected to public office in 1992 as a member of the North Carolina Senate representing the 15th Senate District. She was first elected as Secretary of State in 1996, becoming the first woman elected to a statewide executive office in North Carolina history. Marshall has won re-election three times and in 2008 received the second highest vote total of any candidate in the state. Marshall has been credited with bringing the office into the technological age by introducing e-commerce and providing online registration for lobbyists and businesses. See the conference facebook event at https://www.facebook.com/events/149431342317853/. Find the Conference Registration Form here!! Register online via eventbrite here. The conference flyer is here. Stay in Fayetteville on Friday night so you’re fresh for the conference on Saturday morning. Order your room at the Fairfield Inn, 562 Cross Creek Mall, Fayetteville. A good rate is available online if you order at http://www.marriott.com in advance – $98+tax for a double, less for a king. The regular rate is $109.You can also call the hotel at 910-487-1400. If you want a roommate, email president at raleighnow.org with your name, contact information (phone/email), and any allergies (food or pet) or special conditions. Want to run an ad in the conference program? Use the form at 2017 State Conference Bulletin Form. Want to set up a table at the conference? Use the form at 2017 State Conference Tabling Form. It includes registration. Want to do a workshop related to mobilizing women? Use the form at NC NOW State Workshop Proposal 2017. Find the Conference Registration Form here! Online registration with Eventbrite here. Flyer to print available at NC NOW State Conference Flyer.